2012/13 PANINI TITANIUM HOCKRY. PATCH VERSION! KEY FEATURES. IT MAY TAKE ANYWHERE FROM 1-4 WEEKS TO REACH YOU. 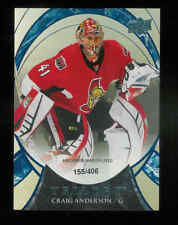 2015-2016 Upper Deck Trioloy Hockey Rainbow Blue Craig Anderson Ottawa Senators Insert Card Number 62. Serial Numbered 155/406. You are purchasing a complete team set of Ottawa Senators from the 2015-16 OPC O-Pee-Chee Hockey 600-card set. The 20 cards in this team set include Mark Stone. Item(s) must be in their original scanned condition. Team: Ottawa Series. Player: Craig Anderson. Card Manufacturer: Upper Deck. Manufacturer: Upper Deck. Serial Numbered: 3/25. Sport: Hockey. Product: Single -Insert. Autograph Authentication: UpperDeck. Team: Ottawa Senators. 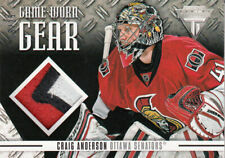 Player: CRaig Anderson. Pictures are scans of the exact card you will receive. Autographed: false. Serial Numbered: 3/25. Manufacturer: Upper Deck. Year/Season: 2013-14. Autograph Authentication: UpperDeck. I'm a paragraph. It's easy. Describe your product. Et bien plus.! / And much more.! We also do casebreaks and boxbreaks online. & HANDLING. Nous avons. However, ASC is owned and run by human beings who are not perfect. Bottom left corner has a minor blemish. Absolute Sports Cards, LLC ("ASC"). Cards are in nrmt/mt condition or better unless stated otherwise. 2018-19 CANADIAN TIRE O-PEE-CHEE COAST TO COAST. BASE CARDS.